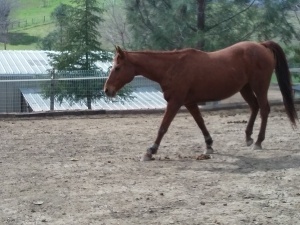 She was at a boarding facility in Northern California and was being used as a broodmare. After not receiving board for 3 months and with proper legal notification, the owner of the boarding facility was going to send her to auction. We were notified by another boarder that she had been injured in a trailer accident, no one else wanted her at the barn and they doubted she would be bought by a reputable person at auction because of the injury. Within a couple of days, she was brought to Heaven Can Wait.